Happy Friday! Well, I'm back...and about to leave again. LOL Yes, it's a busy, busy world for me right now (and, right now, let me mention that you want to read to the end of this blog post, yes you do, you really, really do). 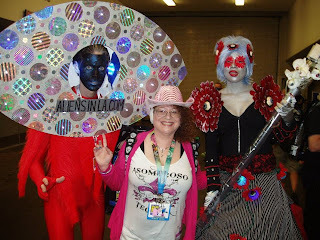 San Diego Comic-Con was da bomb -- awesome to see so many of the Alien Collective throughout the event! My highlight? I got to hug Wolverine! YES! 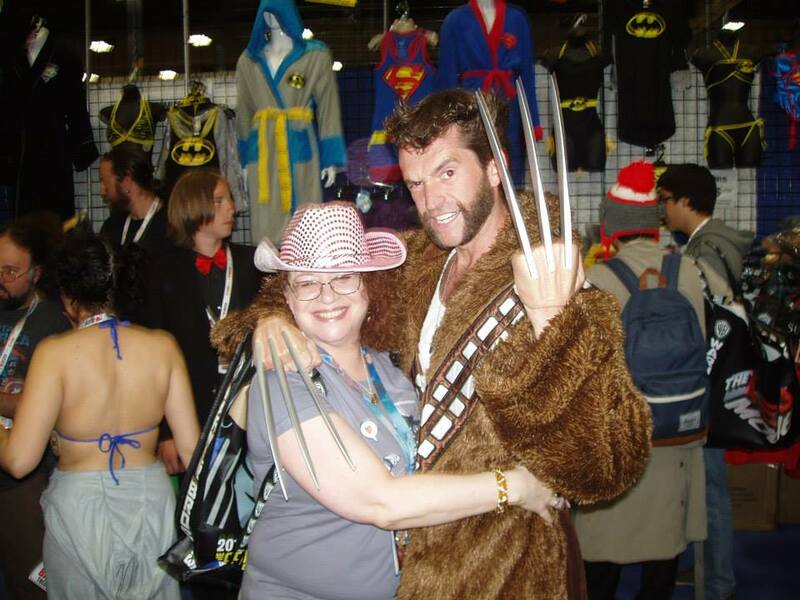 I did some panels and signings and stuff, but WOLVERINE! IN PERSON! It was too awesome! I also met Dr. Who...and though I'm not really a Whovian, he was mighty fine and mighty cool. Note that there ARE Aliens in LA, and they wear A-MA-ZING costumes! Yes, yes, more went on and yes, yes, I will tell you all about it, I promise. Only...not today. Not today because I also realized I haven't actually done my Phoenix Comicon recap. I know! What was I thinking? Oh, wait...I was thinking I wasn't done with Alien Research, that's what I was thinking. But anyway, not to worry. Somewhere soon (I SWEAR) I'll do a compare and contrast about both cons. But before then, there has been a LOT going on in the time I've been gone, so let's get to it, shall we? First off, is Comic-Con still fun? Check out the Slice of SciFi webcast and find out, as well as discovering some amazing new things being done with 3D printing and seeing how to wash your hair in space. 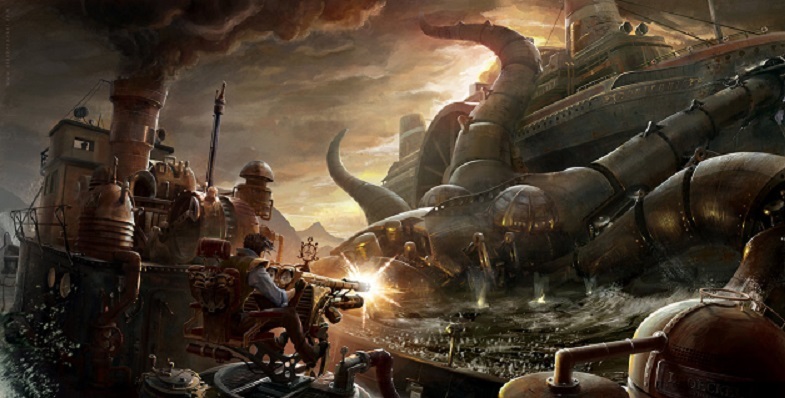 Next up, the CLOCKWORK UNIVERSE: Steampunk vs. Aliens Kickstarter campaign is going well. But, we're not fully funded yet. So, if you want to see an Alien series short set in a Steampunk universe, please head over and support it. ALSO, one fan's already "in" the story, but I'm now offering TWO NEW tuckerizations as well. That means you'll be in this story, as a main or main supporting character, I might add -- but only if you hurry up and grab while the grabbing's good! Now for some reviews. See what H. Bala thought of Touched by an Alien, what Under the Covers thought of Alien in the House, and what I Smell Sheep thought of Amazing and Waiting: Two Novelettes by Jemma Chase (yes, that's moi). Then see what I thought of RED 2 over at Slice of SciFi. Check out which authors Gizmo's Reviews feels deserve more recognition, chime in over at Tor.com about humor in science fiction, and then see the first stretch goal for CLOCKWORK UNIVERSE from Scott Lynch, a map of his created world of Karthain. 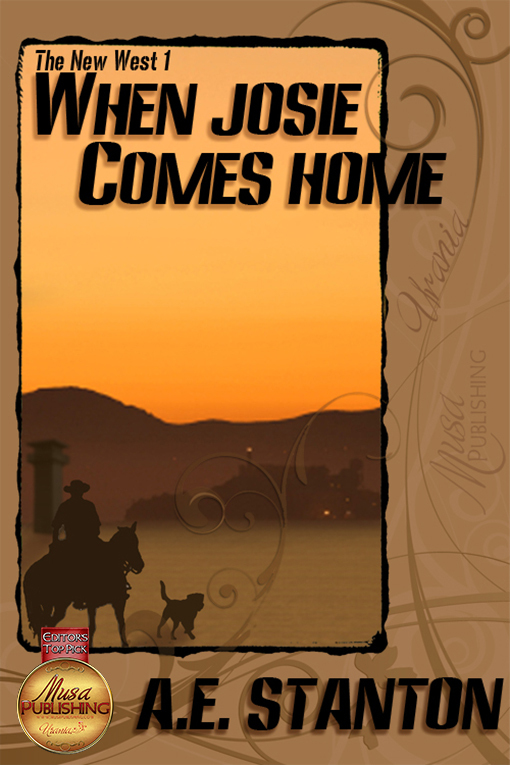 Last but in no way least, I'm thrilled to announce that When Josie Comes Home by A.E. Stanton (yes, that's moi also) has been chosen as an Editor's Top Pick by Musa Publishing. It's quite an honor and I'm so glad this story resonated so much with the Musa staff. So, if you haven't checked out When Josie Comes Home yet, there's no better time than now! DAW Books has just bought Books 12 and 13 in the Alien series! Meaning Alien in Chief will be coming out in December 2015 and Camp Alien will be coming out in May 2016! (Wow, when I type that out, it seems so very far away. Only I know it really isn't. LOL) So, more of Kitty and Company for all of you! Now that's really it for today. I'll be gone all next week having fun with the chicklet so while I'll be on Twitter and Facebook, I will likely be quiet otherwise. Well, as quiet as I get. Figure of speech, okay? (Geez, tough room.) So, please support CLOCKWORK UNIVERSE, jump up and down with me about Books 12 & 13, and let's be readers out there! Peace out, my li'l gangstas, and I'll catch you on the flip side! Happy Tuesday! 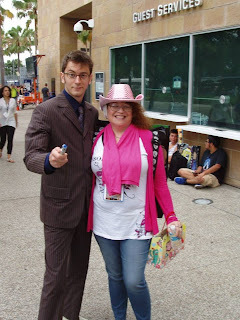 Well, I'm heading off to San Diego Comic-Con, but I'm going to catch you up on all the happenings before I go. First off, let's check out some reviews. See what I Smell Sheep thought of Alien in the House. Then see what Under the Covers thought of Touched by an Alien. Then, check out who Larissa's Bookish Life chose as her Favorite Fictional BFFs. Next, head over to Slice of Sci Fi for a new webcast, Sci-Fi Stamps, and find out, among many other cool things, what I would have named Pluto's two recently discovered moons if I'd had the chance. Now, for some big news. I'm going to be a part of a really cool anthology, CLOCKWORK UNIVERSE: STEAMPUNK VS. ALIENS, from new small press Zombies Need Brains. I know! So awesome! And check out this awesome cover art, "Steampunk Octopus", by Alex Broeckel! Tuckerizations and some other really cool level options are expected to go fast, so definitely check it out sooner as opposed to later. And, as with all thinks Kickstarter, even a dollar matters, so please, give what you can for what's going to be a really awesome anthology. How awesome, you ask? Here are a few of the other authors who are going to be in this antho with me: Scott Lynch, Seanan McGuire, Ian Tregillis, Gail Z. Martin, Bradley Beaulieu, and Caitlin Kittredge! So, definitely check out the CLOCKWORK UNIVERSE Kickstarter campaign, starting tomorrow! 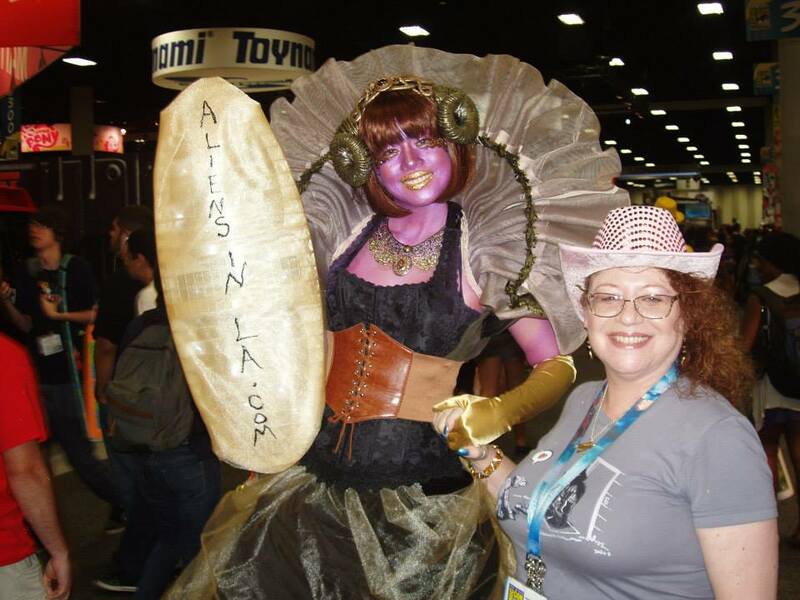 Reminder that my SDCC schedule is here at the Blog, just a couple entries down, so if you're heading to San Diego, be sure to come and see the me! Everyone who won't be enjoying the biggest geekfest on the planet be sure to have a wonderful week and even better weekend. I'll be checking in on Facebook and Twitter as time permits, but otherwise, I'll catch all y'all on the flip side. So, peace out my li'l gangstas, and let's be Steampunk vs. Aliens readers out there! Or, as we can also call it, Reviews, Reviews, Reviews. 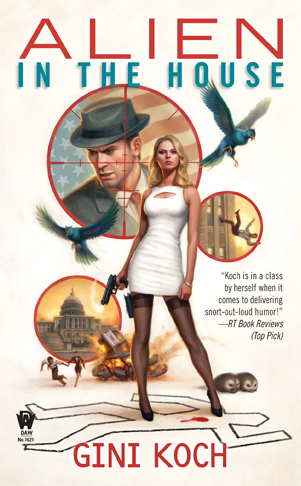 Oh, and, Reviews. Happy weekend to all! I'm getting ready to head to San Diego Comic-Con, so things are in (even more) slight disarray (than normal). And, since we're in the midst of the summer movie extravaganza, I have a lot of movie reviews coming up. So, I figured, what the heck, I'd just give them to you NOW, because I'm a giver, me. 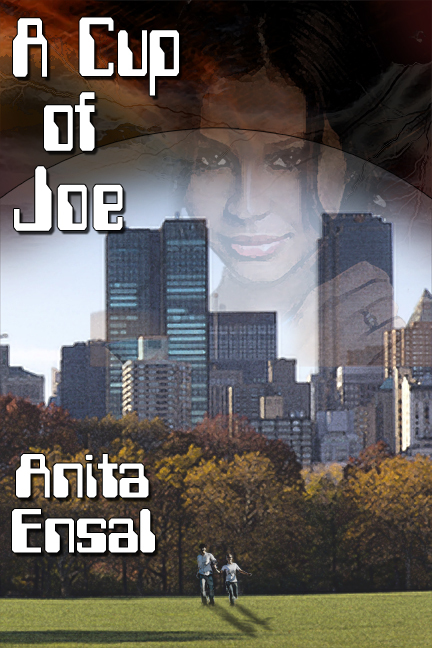 First up, though, check out what I Smell Sheep thought of A Cup of Joe by Anita Ensal (yes, that's moi). Speaking of Slice, check out my review of This is the End over at Slice of SciFi. And speaking of reviews, I've seen several movies over the past couple of weeks that I'll tell you about right here. Finally caught Iron Man 3. I know, I know, where was I? I was on deadline for Alien Research, that's where I was. But now that said bookie wookie is safely turned in and all edits aside from galley are through, I got to catch Marvel's latest. And what did I think? Really enjoyed it. No, it's not as good as The Avengers, but it's better than Iron Man 2. And I happen to like that Tony Stark spends most of the movie cracking wise in the face of danger -- it's something I appreciate. There are a couple of plot points I filled in for myself, but it would have been better if the film had done so for me and the rest of the audience. But still, a nice conclusion to the Iron Man trilogy. Also finally caught Monster's University. As with all things Pixar, it was great. Not the same kind of heart at Monster's Inc., this was truly more like Revenge of the Nerds, but since I like Revenge of the Nerds, I was fine with it. Got home and watched Monster's Inc. right after it -- strongly suggest you not do that in the reverse, as there are some small continuity issues between the two films that would have bothered me a lot if I'd watch MI before MU. Great choice for a family film, though of the animated sequels I've seen this summer, I liked Despicable Me more than Monster's University. However, that's like saying I prefer cotton candy to snow cones. And now to my most recent movie experience, The Way, Way Back. There are two actors I love who have tended, until recently, to fly far under the radar, recognized by critics and their peers as awesome, but ignored by audiences. Peter Dinklage is finally getting some of his long-deserved due in Game of Thrones, and Sam Rockwell is starting to get a higher profile as well. So, I was very excited about this movie because he's in it in a major role. Is this the film that will do for Rockwell what Game of Thrones did for Dinklage? The Way, Way Back is a coming-of-age film starring Steve Carrel playing WAY against type, Toni Collette, Liam James (who played the original version of Young Shawn on Psych, meaning I've watched this kid grow up), Allison Janney, a whole fistful of other great and good actors, in addition to my man Sam. James plays Duncan, a 14-year-old having the worst year of his life -- parents have divorced, dad's moved across the country with his younger wife, and mom's new boyfriend (Carrel) is pretty much a textbook definition of a bullying tool. When Rockwell or the water park are on the screen, this movie is alive. Even when Rockwell's not being funny his scenes are lively, even if he's just standing there. And the water park, old though it is, looks like fun. Everyone's fun or funny at the water park. The dramatic moments there have a lot more life and energy. The rest of this movie is not fun. The rest of the movie is not as light, either, and I mean that in both figurative and visual terms. I'm sure that was the filmmaker's point -- that life is sucking for Duncan everywhere but when he's near Owen and the water park. Thing is, we didn't need 2/3rds of the movie to tell us this and only give us 1/3rd Owen and the water park. I wanted 75% Owen/water park and 25% dreary exposition. Frankly, it's me. I wanted 100% Owen and the rest of the film could go sulk off in its corner. Is this a bad movie? No. It's well done and it's heartfelt. And there is no easy, "happy ending". The lessons learned are about self-reliance and why people who build younger people up are way more beneficial than those who drag them down. All these points are noble and true. But noble and true don't always make for a great movie. I had some quibbles with the passage of time as well, since it's not clear in the film if weeks, days, or only hours have passed. I don't ever need to see it again, but I don't regret seeing it and am glad that I did. And, if you're a fan of any of the actors in this movie, or the genre as a whole, then you'll probably enjoy this movie, at least parts of it, if not all of it. But, Sam Rockwell! Being awesome! As with The Heat, there's sometimes one thing that affects a grade for me, up or down. In this case, the mere presence of one of my Great Ones being there and enhancing the film moved its rating up for me. That's it for now, but I'll check in at least once more before I head to Comic-Con. Trying to find out where you can see the me there? 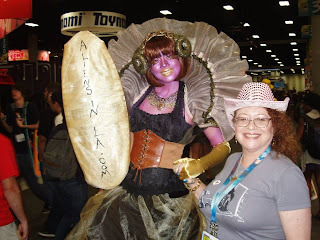 Hit my SDCC Schedule blog post (scroll down one) and make sure we meet up! See the Me at SDCC! Happy Monday! Hope everyone had a nice long weekend. I certainly did! But there's much going on, including my full San Diego Comic-Con schedule, so let's get to it, shall we? We shall! First up, let's check out some reviews and fun things. See what Fresh Fiction thought of Alien in the House. Then see what A Buckeye Girl Reads thought of The Happy Acres Haunted Hotel for Active Seniors. Then check out the series that Larissa's Bookish Life wishes she could unread so she could read them again for the first time. Next week, I head to San Diego Comic-Con. And there's never been so many chances to see the me there! So, come on down, and tell all your friends who are going to catch me at some or all of these events! 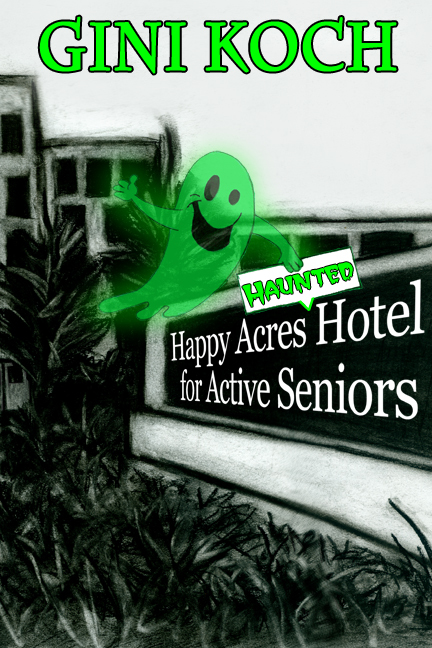 First place where, in addition to all the other bookie wookies, you can get a physical copy of The Happy Acres Haunted Hotel for Active Seniors! Come see the me along with awesome authors Thomas Sniegoski, SJ Rozan/Sam Cabot, Mark Siegel, Mark Kruger, Veronica Wolff, and Peter Clines, while we discuss our super heroic characters and stories! Come see the me along with awesome authors Diana Rowland, Robert Roach, Melissa Jarvis, and Paul Cornell, while we discuss how we build our worlds and develop stories you can't stop reading! Coming to SDCC or will be in the area? Be sure to let me know so we can meet up! If you're not making it to SDCC, or you just want to see the me that much sooner, check out the Slice of SciFi live show taping this Thursday, July 11th, at 8pm Pacific. I'll be in the studio, and if you watch us live you get to hear all the jokes and banter that gets edited out of the final shows. It's a lot of fun, so don't miss out! That's it for today, but as always, more's on the way. So enjoy the week, and let's be readers out there! Happy Hump Day! Hope everyone's having a great week! For those in the U.S., enjoy the 4th of July celebrations and weekend. For those outside the U.S., um, enjoy YOUR 4th of July week and weekend, too. It's a nice time of year, no matter where you are. But we have things to get to, so let's get to them, so we can all race to the weekend. Next up, see what Books-n-Kisses thought of Alien in the House. And now, let's see where you can see the me in the coming months, shall we? We shall. 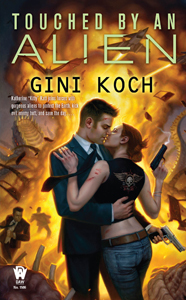 series), Peter Clines (Ex-Heroes), and Gini Koch (The Alien Series). Going to SDCC? Be sure to let me know so we can hook up and hang out! DarkCon 2014 is heating up, and you don't want to miss it. Not only am I a Local Guest of Honor, but they're making one whole day GiniCon, so you want to be sure to attend. It's gonna be huge. Phoenix, AZ, January 9-12, 2014. If you can only go to one con in 2014, make it this one! For those of you in or around the Florida area, I'll be one of the Featured Authors at Coastal Magic in Daytona Beach, FL, February 6-9, 2014. Tons of awesome authors, great hotel, it's gonna be a blast! That's it for today, but as always, more's on the way. So enjoy the downward slide to the (for some of us, much sooner) weekend, and let's be readers out there! Peace out, my li'l gangstas, and I'll catch you on the flip side!